Head back in time with Laura as we take a 12-week tour reading aloud “Little House in the Big Woods” or ANY book from those days. 18 crafts, hands-on activities and lessons are included as you prepare for a Gold Miner’s Camp Party and gathering up all your handicrafts for the local or state fair. Holly takes you step by step in this easy to follow unit study that will thrill the whole family and create a special memory of this learning experience. History, science, geography, poetry, handicrafts, cooking and a whole lot of fun are included in this unit that will make family memories to look back on. Make a rag doll, a chromatrope, a ribbon book, a weaving activity, cook, sew, manners and a host of prairie fun. Perfect any time of the year. Organized to use as a family or a co-op. 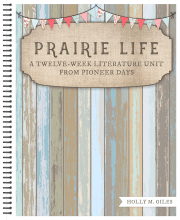 Our online Prairie Life Book Club is available in our online course site. It is self-paced and full of video tutorials, in-depth information into our history with music, animals, life skills and much more. Each week moves you through the book and brings it alive with links to more fun and creates a memorable experience.